EcoGreenText's Micro-Seed Pads are an excellent solution for growing all microgreens, micro herbs, wheatgrass, barley grass, bean sprouts, pea shoots and many more. 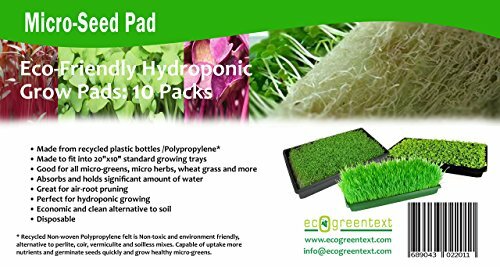 Made from recycled plastic bottles / Polypropylene, these growing pads are designed to effectively absorb and hold optimal amount of water, allowing seeds to thrive in a variety of Hydroponic systems. Our grow mats provide an efficient method of growing soil type sprouts without the mess of soil. These seed pads are made to fit into growing trays correspondent to the pads size. Micro-Seed Pads are produced from recycled non-woven Polypropylene felt, they are Non-Toxic and disposable. If you have any questions about this product by EcoGreenText, contact us by completing and submitting the form below. If you are looking for a specif part number, please include it with your message.